This article shows how to protect art from sunlight using smart glass (also known as electro-optic glass or switchable glass). This involves not only reducing light exposure on museum quality works of art but also allowing exhibition of the object in human photopic vision. This is achieved by tuning the amount of light entering the vitrine and the time that the object is exposed to light, according to the sensitivity of the materials on display. Lets now break all this down by first looking at the types of materials and their sensitivities to light. For this we turn to the CIE Technical Report “Control of Damage to Museum Objects By Optical Radiation, CIE 157:2004”, which we will call ‘CIE 157’ and is summarised in Table-1. 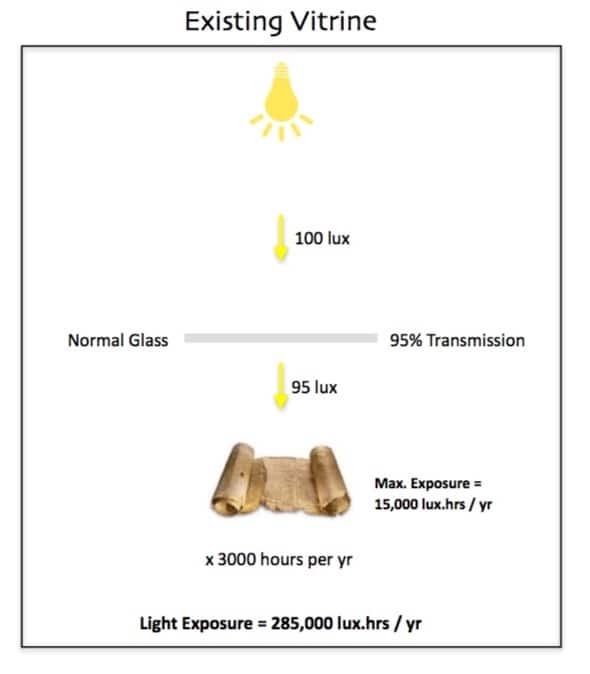 We see that the most sensitive types of materials (CIE category 4) include silk, fugitive colourants and newspapers, which should not receive more than 50 Lux illuminance and not more than 15,000 Lux-Hours light exposure per year. Even under these strict display conditions, and even with UV-filtered light, you would see a noticeable deterioration on CIE-4 objects within 2 – 21 years. The light exposure corresponds to the time-integral under a graph of incident light. i.e. we are multiplying the incident lux levels by the time that the object is exposed, which gives us the Lux-Hours exposure, or total energy received by the object. Fig. 1 shows a conceptual model of a display case, housing a light-sensitive object and illuminated by a light source. The light source is assumed to have a Correlated Colour Temperature (CCT) of between 2900K and 4200 K and a Colour Rendering Index, CRI >= 85. 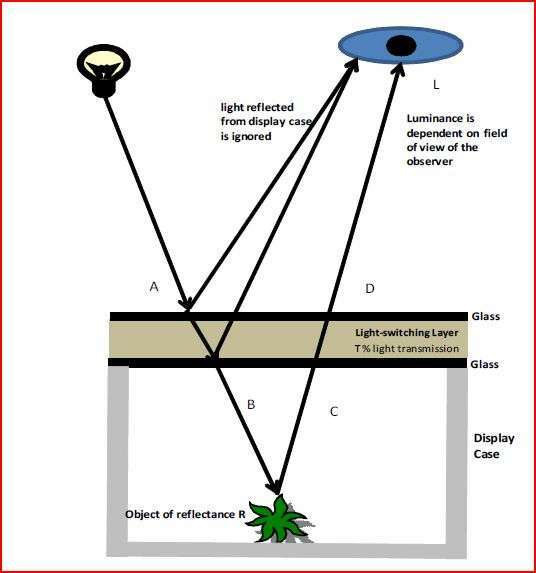 An observer perceives light reflected from the object as a field-of-view dependent Luminance, L. The display case glass has a Transmittance (i.e. how transparent the glass is), modelled as T.
The Illuminance incident on the display case is marked A, of which T% is transmitted by the glass into the display case. This results in B Lux entering the display case and illuminating the object (assuming no other internal artificial light sources are present). 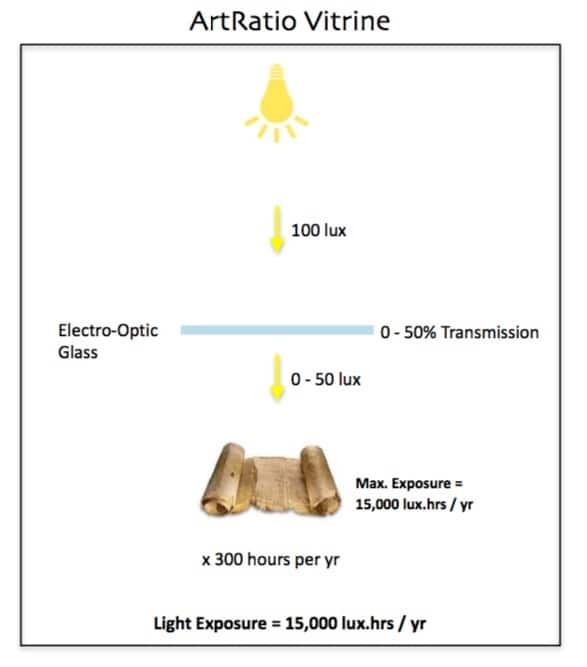 The object reflects a fraction R of the light as C Lux, of which T% is transmitted out by the glass and leaves the display case as the Exitance D in lumens / m2. Assumption from Ref 2 :- as long as the exitance D is above 10 lumens / m2, the observer will receive a luminance L of 3 cd / m2 in the field of view, sufficient to allow photopic (i.e. colour) vision, which allows better perception of fine details and colours present on art. 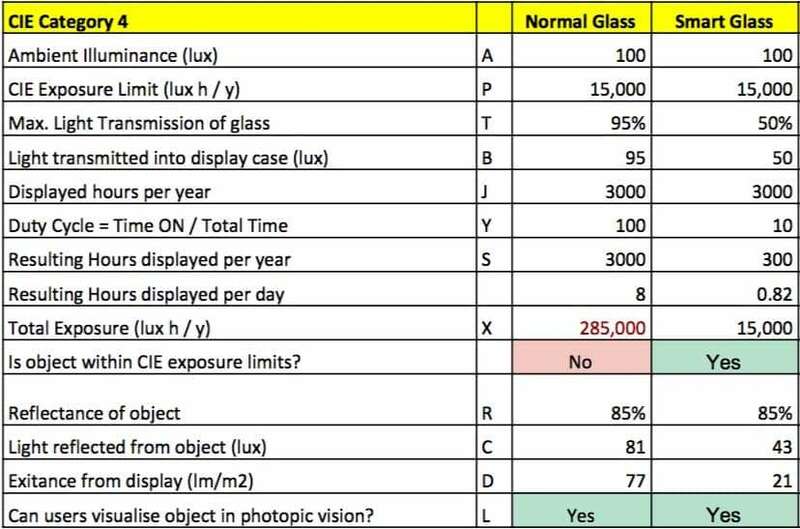 Table-2 now compares a normal (non-switchable) glass versus a smart glass vitrine where the objects are on display under an illuminance of A=100 Lux, for J=3000 hours per year and the glass transmits light during Y% of that time (called the duty cycle) at a specific transmittance, T% . A representative object reflectance R of 85% is assumed but this will of course be different for each work of art. If the activation of the smart glass is triggered by visitors, the Duty Cycle Y effectively captures the visitor popularity of this object, which we have modelled as 10% in this case, corresponding to 300 hours per year. This fine-tuning allows the object to be displayed in human photopic vision, whilst also controlling the overall light exposure to within CIE 157 limits. This article shows how smart (switchable / electro-optic) glass can be used to protect art from sunlight. If you would like us to provide further analyses based on concrete values for your specific display requirements, please contact us.